Discovery Cove, a wondrous place of adventure and fun, a place to experience many different realities, and even a few dreams. To swim with the dolphins in Orlando is always a popular request, and rightfully so. 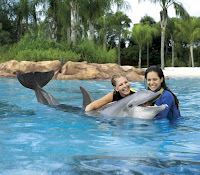 There are many different activities offered in Orlando such as the all inclusive package which contains the dolphin swim, snorkeling with tropical fish, hand feeding birds, access to resort pools, swimming in tropical made rivers, lunches and dinners are included, snacks beverages and all the gear and equipment necessary to do all the activities in, not to mention the 14 day unlimited admission to Seaworld Orlando, Bush Gardens Africa or the new Aquatica. Within Discovery Cove Orlando, you will experience magic and adventure like never before, be prepared to be lifted to another world that transcends time and space. There are so many different activities to do but never enough time. Be prepared to go out and hear the sounds of the dolphins and other animals come alive and inhibit you. You feel as though you were apart of nature itself, see the wildlife and the ecosystem. Experience the Biosphere at its most extreme and see the world as it was meant to be seen without, concrete or metal, or worries and stress, only serenity and harmony.